It is August, 1914. World events are spiralling out of control. The major powers of Europe are mobilising. the Empires and their Alliances are going to war! The major powers have been developing their war plans for years and now the full force of arms will be brought to bear like never before. War on an industrial scale has begun. Most of the national leaders and thier generals expected a short war. Hence, the phrase "Home Before The Leaves Fall". In the 1914 scenario both players have an opportunity to achieve that elusive quick victory. Can the Germans obtain the upper hand in France before the Russians overwhelm the outnumbered Central Powers forces in the east? Empires & Alliances has a simple game system with minimal rules so it is a large but very playable game. The Sequence Of Play features a reinforcement phase followed by a Supply Phase, then a Movement Phase and a Combat Phase. Reinforcements continue throughout the war. The basic unit is the corps with a few divisions. There are infantry, cavalry, and army level artillery units. Tanks, air, and Stosstruppen begin to arrive in 1917. Units have historical corps and division IDs. 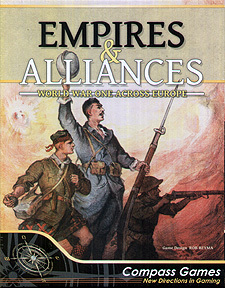 Empires & Allies differs from most World War I games as it is relatively easy to attack, though combat tends to be bloody. COmbast uses an odds-based CRT with strength multipliers and DRMs, all resolved with a ten-sided die. Players are challenged to allocate their forces and plan their offensives to exhaust their enemies before they themselves are exhausted. For the 1914 starting scenarios, players set up their armies in their historical mobilisation sectors. Also, an optional rule for Flexible Mobilisation allows players to explore various possible openings to the war. Will you get your troops "Home Before the Leaves Fall", or will your "Empires & Alliances suffer through the years of industrialised war? Map: 3 at 22"x34" and 1 at 22"x11"